It’s time to play the music. It’s time to light the lights. 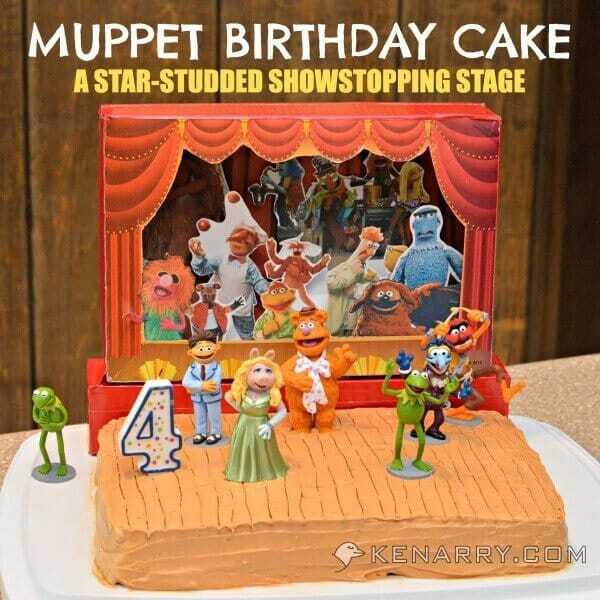 It’s time to meet the Muppets on the Muppet Birthday Cake tonight. Anyone else have the full theme song to the Muppet Show floating through your head right now? You’ll be humming it all day after you see today’s post. 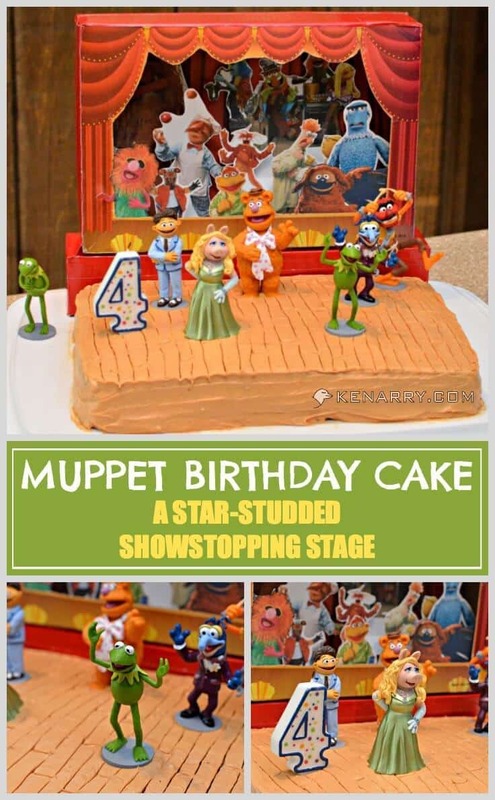 We’re sharing how to make an easy star-studded showstopping Muppet stage cake to celebrate a child’s birthday. Our son, C1, is a huge Muppet fan thanks to the “My Muppets Show” game on the iPad. The game allows him to earn Muppet characters, like Kermit, Fozzie Bear, Miss Piggy and Gonzo. He can then move them around on different stages, feed them and do other activities. When we talked about what he wanted for his fourth birthday cake, we weren’t the least bit surprised he wanted a Muppet birthday cake. Kent and I didn’t want to disappoint C1 so we brainstormed the best way to create a Muppet birthday cake for him. 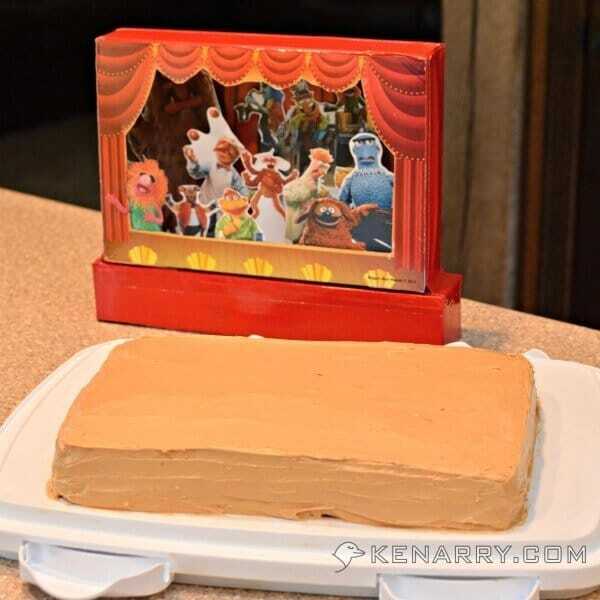 Rather than try to recreate the characters with icing, we thought it would be easier to make a simple rectangular cake and use Muppet figurines instead. Thankfully, the Muppets Most Wanted movie just came out this spring so it was easy to find a Muppets Most Wanted 7 Figure Playset. The set included many of C1’s favorites: Kermit, Miss Piggy, Fozzie Bear, Gonzo, Animal and Walter. The playset also included Constantine, the “evil” Kermit in the new movie. 1. 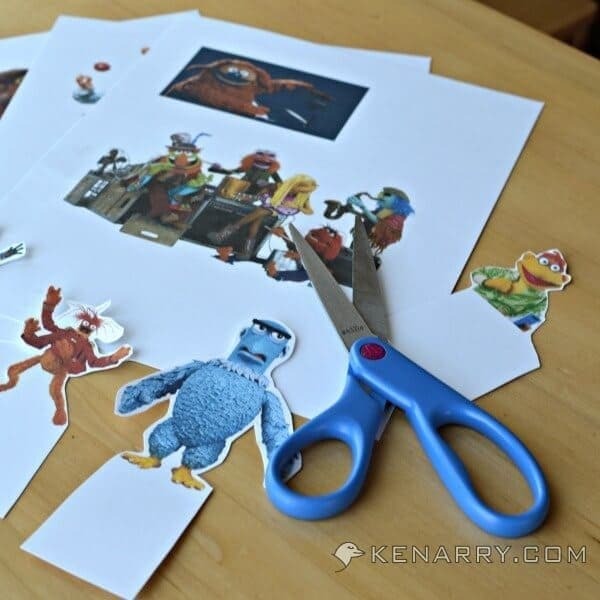 Determine how to incorporate all the Muppets a kid could want. When we showed the Muppet playset to C1 and talked to him about the plan for his Muppet birthday cake, C1 wasn’t so sure he wanted Constantine on his cake, and while he liked the other characters he was quick to point out all the Muppets who were missing. In a very serious and urgent tone, he told me “Well, Mommy, on my stage cake I want Rizzo the Rat, Scooter, Rowlf, Sweetums, Beaker… and Sam Eagle. I’ve got to have Sam Eagle. And what about Mahna Mahna? Oh and Dr. Teeth, Janice, Floyd…” He went on and on listing every Muppet imaginable, including some I never even knew existed. There was no way I’d ever find a playset that included ALL the characters his little heart desired. 2. 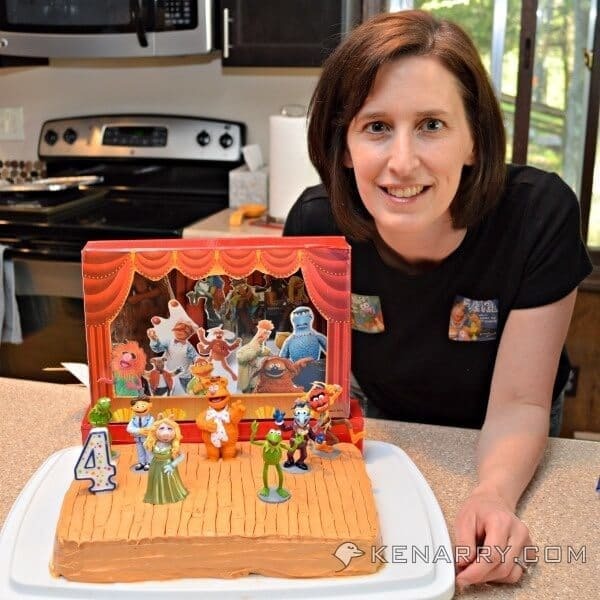 Create the stage backdrop for the Muppet birthday cake. 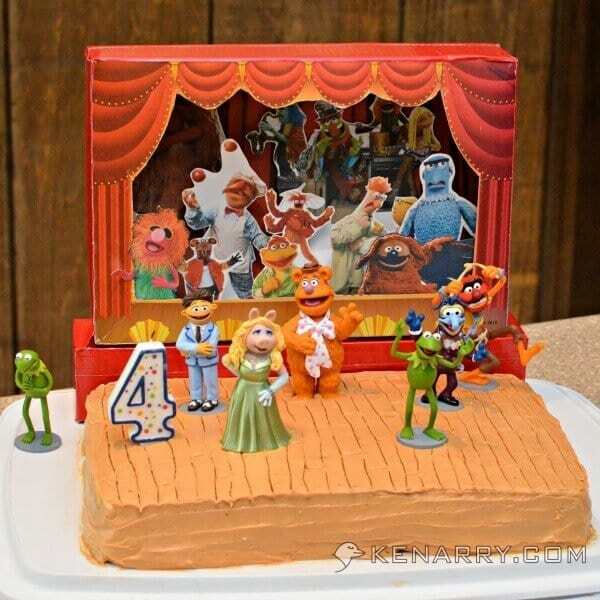 If you’re trying to replicate this Muppet birthday cake, you likely won’t luck into a cereal box with a stage curtain on the back like I did. 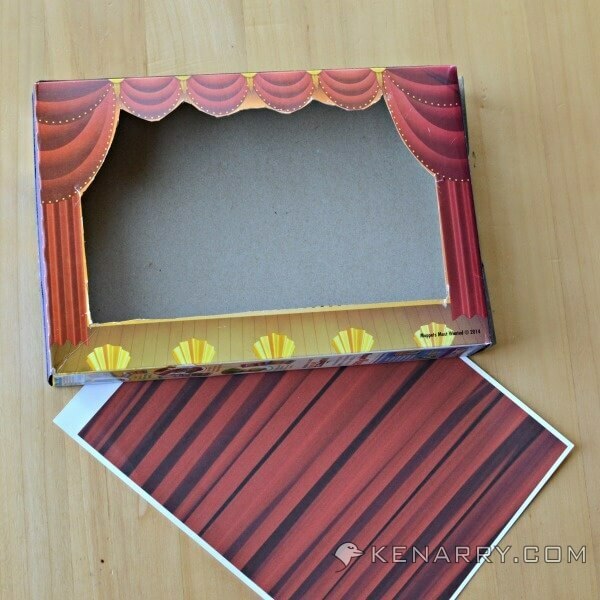 Instead, you can do a Google image search for a red stage curtain, print it and paste it to the back of a cereal box to create your own. After cutting around the outline of the curtain on the back of the Frosted Cheerios box, I searched online for an image of a plain red curtain. I printed it from my home computer and taped it to the inside of the cereal box. 3. Make every Muppet character your child can imagine. “Every” Muppet character imaginable may be a bit of a stretch, but I did a Google image search for all the Muppets my son initially listed for his Muppet birthday cake. I printed the pictures on white card stock using my home computer and cut around each of them. 4. Affix the Muppet characters to the stage. 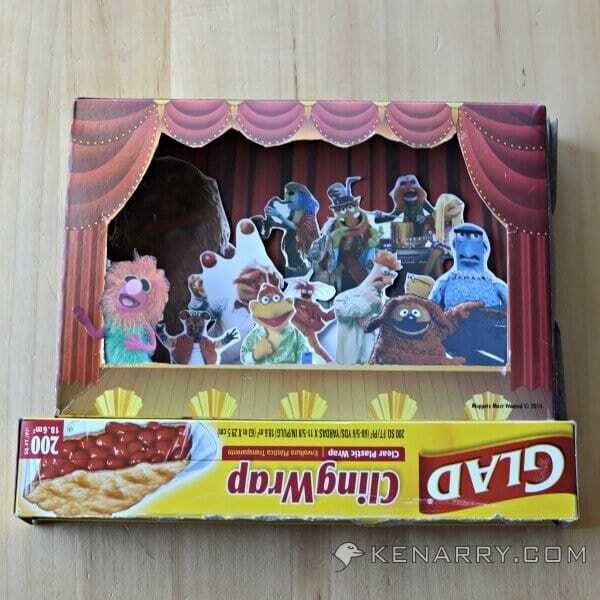 I arranged the Muppet paper cut outs within the frame of the stage and taped them to the bottom of the inside of the cereal box so they wouldn’t slide around. I then taped the cereal box to a leftover plastic wrap box to raise the stage to be even with the top of a 9 x 13 cake. You’ll see in later photos, I also used red duct tape to cover the outside of the cereal and plastic wrap boxes. 5. 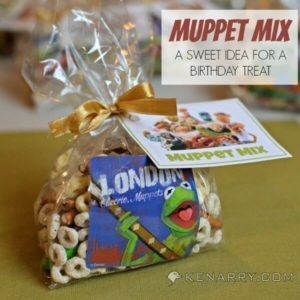 Bake the Muppet birthday cake. This is the easy part. Just follow the instructions on the box of your favorite cake mix. Here’s a great tip I learned from my mom. 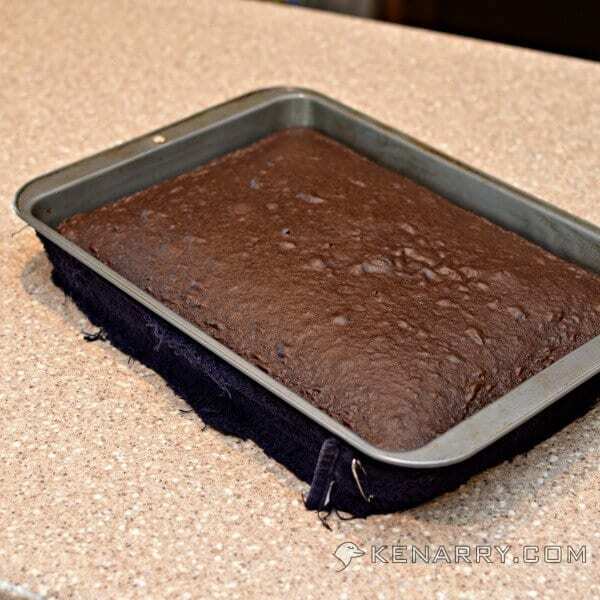 To keep the top of your cake flat, wrap your cake pan with a long strip of an old terrycloth bath towel. 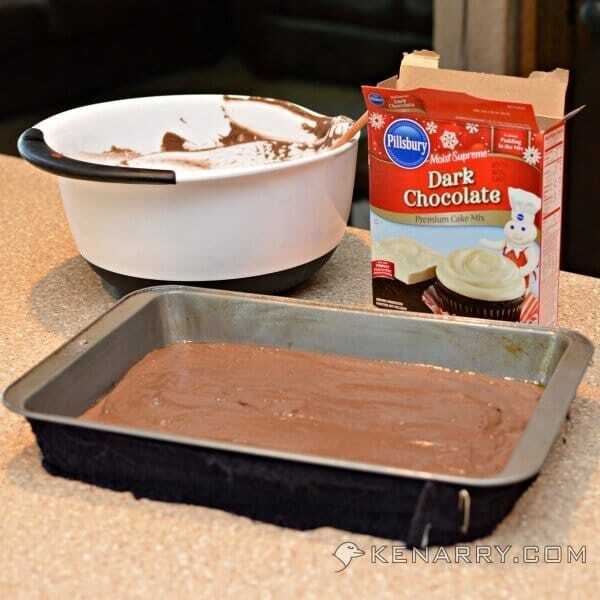 Before you wrap the towel around your cake pan run it under cold water and wring it out with your hands. You can use a safety pin to keep the towel securely in place. As you can see in the photo below, doing this helps the cake to cook more evenly. Otherwise the outer edges cook first causing the batter to rise in the center. 6. Frost the Muppet birthday cake. Once the cake has cooled, run a knife around the edge of the pan to loosen it, if necessary. 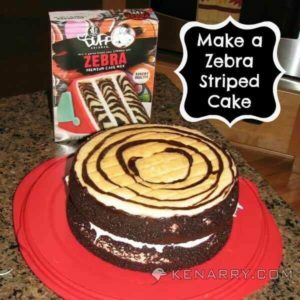 Carefully flip the cake on to a large rectangular surface so you’re ready to frost it. We used a cake carrier with a lid so we could easily store and keep the cake covered until it was time for C1’s birthday party. 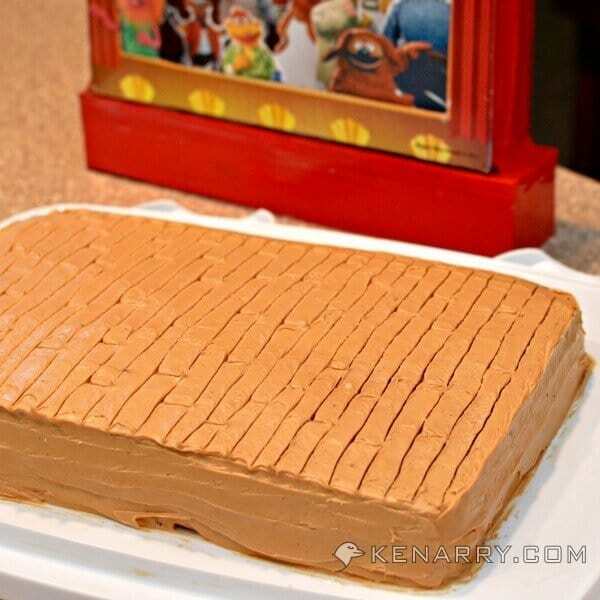 Frost the cake with a caramel colored frosting to look like the floor of a wood stage. My mom’s tip for frosting cakes is to always move your knife across the cake in the same direction as you frost. If you go back and forth with your frosting knife, you end up with cake crumbs in your frosting. 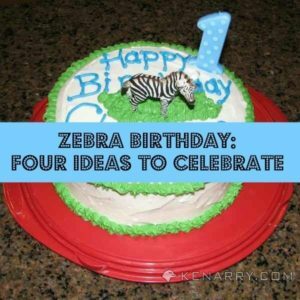 Next, use a toothpick to draw wood planks in the frosting on top of the cake. 7. Place the Muppet characters on the stage. 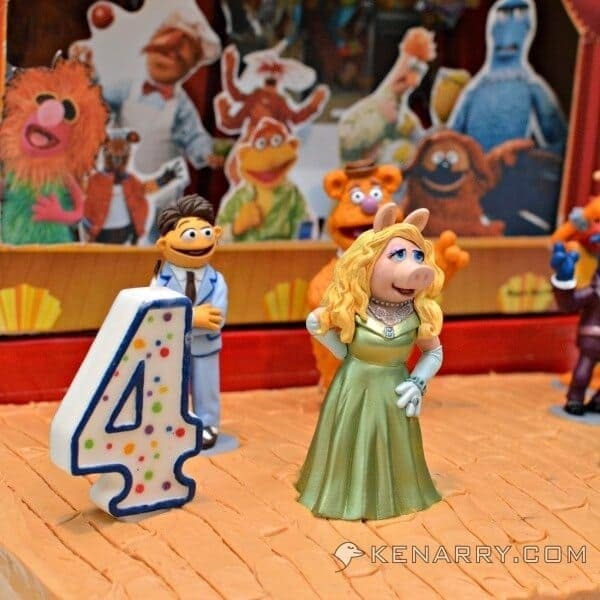 When you’re ready to serve the birthday cake, add the figurines and any candles to the Muppet birthday cake. 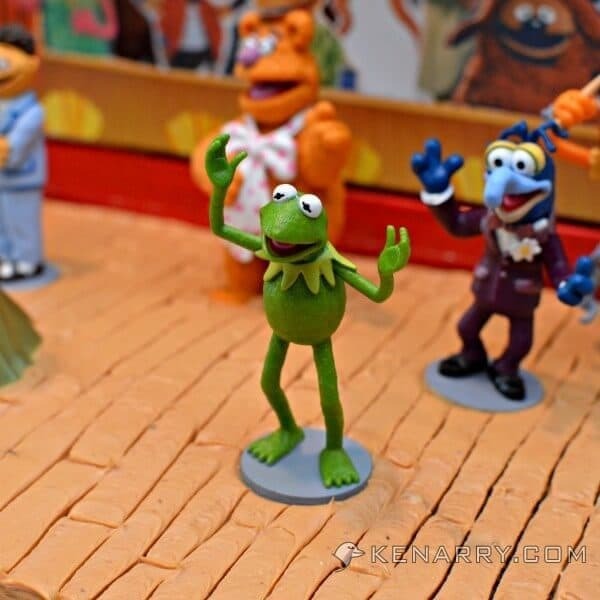 The Muppets Most Wanted figurines are flat on the bottom, which makes it really easy for them to stand up well on a cake. The Fozzie Bear figurine is a little heavier, so we needed to place a toothpick behind him to keep him from falling backwards into the frosting. , which can all be found on Amazon.
. We made him open it as his last present because we knew once he saw the book he wouldn’t be able to put it down and then we’d never get to have cake. C1 was absolutely thrilled by it all, but nothing beats his huge ear-to-ear grin when he saw the Muppet birthday cake for the first time. “It’s MY Muppet stage!” he proudly exclaimed. This is such a cute cake! It looks so easy to put together too. I wish I would’ve seen it a few years ago. My little cousin loved the muppets this would’ve been perfect. Happy Thursday. Thanks, Leslie! It’s never too late for the Muppets if you ask me, though. Maybe you could still make it for your little cousin? It is so much fun having a son who loves the Muppets. It brings back many childhood memories. So glad you love it, Erica. Thanks for taking the time to comment. I love the Muppets! It would never have occurred to me to use a cereal box to add a curtain and extra characters. Thanks, Elizabeth. Now that my son’s birthday is over, the cereal box with the extra characters makes a great playset as a backdrop when he plays with the Muppet figurines from his cake. I even used some of the red duct tape to create a handle so he can carry it around the house. Oh my goodness! The towel trick sounds fabulous. I am so doing that next time I bake a cake. Fabulous Muppets cake! Ashley, thanks for your kind words about the cake. That towel trick works like a charm! It makes such a difference.